Events in Gothenburg, earlier this Sunday afternoon went a long way to highlight the surge in xenophobia, Islamphobia, racism, intolerance, prejudice and bigotry in Sweden. You probably heard that a group of local neo-Nazis rallied for an anti-mosque demonstration in the beautiful city of Gothenburg, today at lunch time. Why were there on the streets? Well, the construction of a new mosque is scheduled to start on Tuesday in Hisingen - an island in Gothenburg. Apparently, neo-Nazis are opposed to the construction and secured a permit for their anti-mosque demonstration. However, little did they know that there will be up against a counter-demonstration led by the "Network Against Racism". 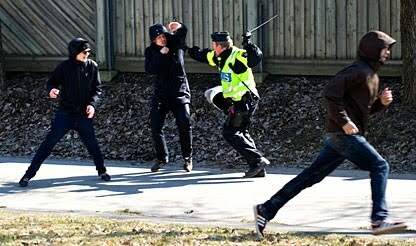 At midday today, police in Gothenburg had some work to do - in order to keep the peace and prevent the opposing sides from clashing. The police formed a human barrier, as indignation and animosity flared up between the neo-Nazis and the anti-fascist group. When the news broke on The Local, I was taken aback and wondered aloud - what is Sweden turning into? Is Sweden now a haven for hate, religious intolerance, Islamphobia and fear mongering? 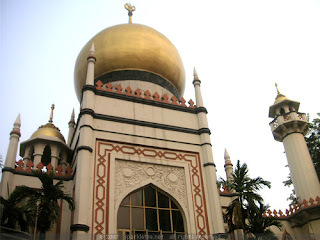 Shouldn't Muslims have a place of worship? What's the next target group? Something needs to be done as soon as possible to educate the Swedish population about the need for diversity in a civilized society. The anti-mosque demonstration in Sweden this Sunday was uncalled for and represents a threat to religious freedom in the Scandinavian country. Believe it or not! You'd agree that such a demonstration has no place in a democracy. As mentioned earlier, construction of the Mosque will begin on Tuesday. I'll be following the story closely. Please gods bless Europe, help her survive these terrible times. Because liberals want Europeans dead. RS, you're right. Peaceful muslims bear the brunt of this surge in islamophobia and unfortunately, very few people seem to care.